Now that summer has arrived and temperatures are rising, we will begin to see all kind of beautiful maxi dresses, shorts and mini skirts. 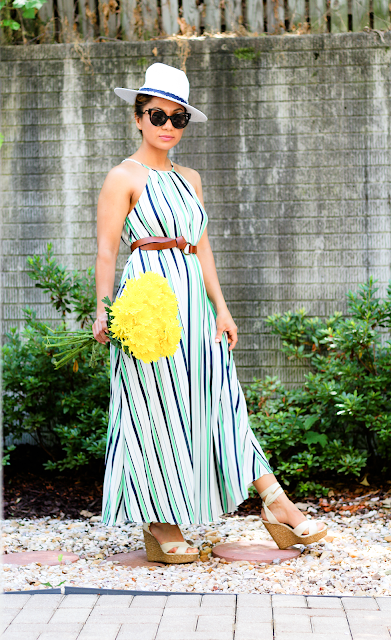 So on today's post will be all about this Cruz Pleat Maxi Dress. This beautiful Line + Dot dress it adorned with nautical stripes and its pleated construction sway with each step, making it perfect for beach parties or daytime cocktail pasties. Add sunglasses, your favorite wedges and a fedora hat and Voila you're ready. Go to ilymix.com to get amazing sunglasses like that ones I'm wearing.